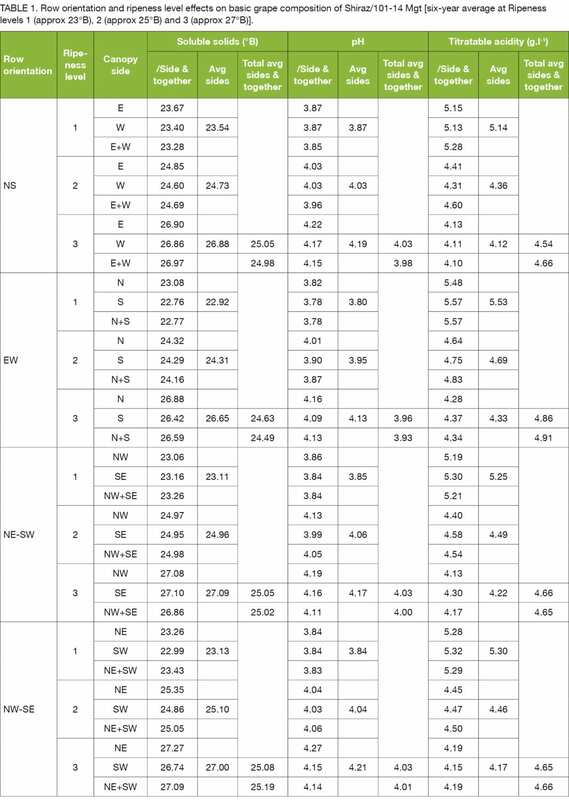 Wine chemical and sensory characteristics of differently orientated vertically trellised Shiraz grapevines (NS, EW, NE-SW and NW-SE rows) were investigated at three grape ripeness levels (approximating 23, 25 and 27°B). Vineyard row orientation is one of the main factors that determines total and direct amount of sunlight energy intercepted by the grapevine canopy during the growth season. However, an efficient, yet sufficient canopy and a proper exposure of grapes are required to support a consistent, healthy and viable yield and grape composition that would result in high wine quality. Furthermore, a well-managed canopy would allow a wider window and more options for selection of a product-directed grape ripeness level/harvesting time, the latter which had already been shown to have a major effect on skin:juice ratio and grape and wine flavonoid concentration and profile in particular. Although sensory descriptions and associated volatile and non-volatile chemical characterisation of wines from different varieties have been profiled, it has not been fully explored with regard to specific viticultural intervention, such as canopy orientation/microclimate in combination with grape ripeness level. Profound consequences of row orientation for canopy sunlight interception and berry temperature profiles perfectly link this viticulture practice to a global climate change that would impact at macro-, meso- and microclimate levels, notably increasing greenhouse gas concentrations, positive radiative forcing and warming in the atmosphere. Reaction of the grapevine to these climatic changes is inarguable and likely consequences lie at vine physiological and grape compositional levels. Many other potential implications of climate change on wine grape growing and wine quality include added pressure on scarce water supplies and a change/migration in terroir, timing of phenological events, varietal selection, harvest date and wine style. Although grapevine row orientation, together with other long-term viticulture practices, such as plant spacing and trellis system, may have a determining effect on optimal utilisation of a terroir, little focused scientific evidence of its impact on grape composition and wine quality exists. The effect of row orientation [North-South (NS); East-West (EW); North-East-South-West (NE-SW); North-West-South-East (NW-SE), each replicated five times on a flat site of approximately 3 ha], at fixed row (2.7 m) and vine (1.8 m) spacing, on climatic profiles of canopy and grapes of spur pruned (two buds) vertically trellised Shiraz/101-14 Mgt was determined at the Robertson Experiment Farm of ARC Infruitec-Nietvoorbij in the Breede River Valley, a region that experiences semi-arid macroclimatic conditions. Due to low precipitation and inconsistent rain events in summer, vines were irrigated weekly at a volume of 14 mm during the high season period. A cover crop (rye) was sowed after harvest and killed before budding. Vines were uniformly managed and were only vertically shoot positioned and topped; both actions were performed on average three times per year. Berry composition measurements (for six consecutive seasons) included must soluble solid content, titratable acidity and pH, as well as berry skin total anthocyanins and phenolics, of grapes harvested on each side of the canopy, as well as together (equal to normal field harvesting) at three harvest dates (approximating 23, 25 and 27°B, respectively). Standard winemaking procedures and analyses (for five consecutive seasons) were followed on the same batches of grapes. Grapes were cooled overnight to the same temperature (20°C) before processing. The pomace was inoculated with VIN 13 yeast. No malolactic fermentation was performed. Apart from standard wine analyses, bottled wines were also analysed for total anthocyanin and phenolic contents. Each racked wine was sub-divided into two lots of 20 ℓ and wood (medium-toasted French oak staves – Radoux) added to one 20 ℓ stainless steel canister according to supplier specifications. Containers were stored in a temperature-controlled (24°C) room, allowing the wine to be in contact with wood for six months before it was bottled. Wine sensory evaluation was conducted by an expert tasting panel consisting of 12 persons (SA wine industry winemakers and experienced tasters from ARC Infruitec-Nietvoorbij) using a non-structured 100 mm line-scale method and pre-selected descriptors. Compared to NS, NE-SW and NW-SE row orientations, ripening of grapes from the EW row orientation seemed delayed at all ripeness levels, in agreement with generally lower interior-canopy light microclimate and higher vine water status and berry volume found for this treatment. Canopy side differences in grape composition may have been caused primarily by the direct light radiation (and consequent berry temperatures) that clearly differed between canopy sides (as shown in a companion article). Values of grape must soluble solids and pH increased and those of titratable acidity decreased progressively with grape ripening (Table 1). Grape composition on separate canopy sides varied consistently for all grape ripeness levels. Warmer sides (NE, N and NW) of canopies generally indicated more advanced ripening at respective harvest stages. The biggest difference in soluble solid concentration occurred between the NE and SW sides of the NW-SE orientation, in accordance with the difference in radiation interception of the two canopy sides. For NE-SW, a lower ripeness level was expected for grapes on the morning sun side (SE) given the much lower sun interception during this period vs that received during the afternoon (NW). For the NS orientation, the longer exposure and more intense radiation during the afternoon that occurred already from pea berry size was expected to advance ripening of grapes on this side (W) of the canopy; this, however, did not materialise. The W side of the NS orientation had similar soluble solid content than that of the E side and only slightly different titratable acidity and pH. Similar grape composition was found when regular commercial harvesting (sides harvested together) of each row orientation and an average of the two separate canopy sides were compared. The °B:TA ratios were lowest for the EW row orientation, whereas those of the rest of the row orientation treatments were similar. The NW-SE orientation showed highest and the SW, W, NW and N sides generally lower skin total anthocyanin and phenolic contents (data not shown). A decreasing trend in flavonoid contents with ripening was accompanied by a loss of water from berry skins, but anthocyanin and phenolic contents were unrelated to skin water content. In agreement with higher berry volumes, the EW orientation also had highest berry skin water contents. The ratios obtained from regular harvesting of each row orientation and those obtained by averaging the values of the two separate canopy sides were closest at the last ripeness level. This suggests that potential distinguishing effects on grape composition (and wine style) of different light exposure profiles to which different canopy sides are subjected during the growth season, may diminish when harvesting is delayed to such an extent that grapes become over-ripe. This may also be applicable to any other seasonal viticulture treatment done with the aim of introducing special characteristics in grapes and wine. 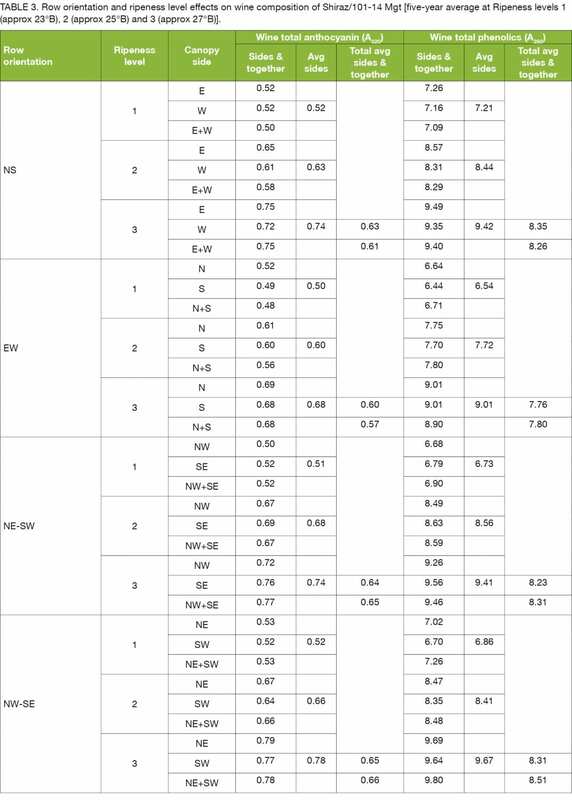 Chemical non-wooded wine composition of the different row orientation treatments (made from “normally” harvested grapes only) showed no significant differences at each ripeness level (Table 2). Alcohol and extract of the wines showed consistent, increasing trends with grape ripening. 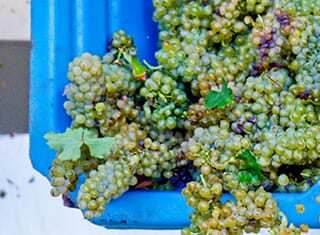 Wine alcohol, extract and residual sugar of the EW row orientation tended to be lower and total acidity higher than those of the other treatments at the two higher ripeness levels. Opposite to trends found for skin anthocyanin and phenolic contents, wine total anthocyanin and total phenolic contents of all row orientations increased with progressive grape ripening (Table 3). Wine colour and phenolic composition of EW-orientated vines were reduced at all ripeness levels. The consistently higher berry mass and volume of the EW orientation, compared to those of the other row orientations, may have led to a lower extraction potential of flavonoids during crushing and alcoholic fermentation at all ripeness levels. Differences in wine phenolic contents were also evident between sides of canopies of differently orientated rows. The NS orientation resulted in higher wine phenolic contents at the first ripeness level, whereas the NW-SE orientation led to highest phenolic contents at the third ripeness level. The total wine phenolics tended to be higher on the N, NE, E and SE sides of canopies. 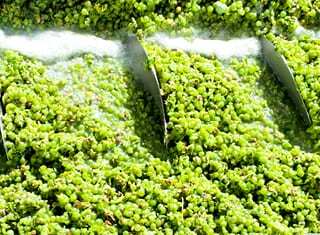 The skin:pulp ratio is important during vinification. A loss in cellular integrity during the berry softening and shrinking process during ripening, a phenomenon commonly associated with the Shiraz cultivar, may enhance extraction from skins during vinification. As the final berry size and composition at harvest would be an expression of integrated effects of many biotic and abiotic factors (temporal/seasonal and long term), that would eventually also be expressed in wine, surface:volume ratios cannot always be considered a measure of level of extractable quality determining compounds. 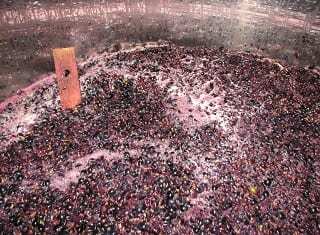 In a previous study we found that grape ripeness level, over-ripeness in particular, affected chemical and physical condition of Shiraz berries, as well as fermentation patterns and release kinetics of individual anthocyanin molecules in the complex fermenting matrix during maceration. Even though similar total anthocyanin contents may be found for different row orientations, composition of individual anthocyanins and derivatives (p-coumaryl-glucosides, acetyl-glucosides and mono-glucosides), as well as phenolics, may not be comparable and may lead to distinctive sensory nuances in final wines. Although the aroma of Shiraz is commonly described as spicy, dark fruit and berry-like, wine styles may change considerably depending on environmental conditions, viticulture practices and winemaking techniques. In general, total wine sensory profiles of all row orientations (and differentiated by canopy sides) were progressively elevated with riper grapes (Figure 1). In non-wooded wines, sensory perceptions of colour intensity, fruity aroma intensity, spicy aroma intensity, tannin intensity, body mouthfeel, jammy aroma intensity, alcohol intensity and finish persistence, generally increased with an increase in ripeness level. Other wine attributes, such as pepper aroma intensity, acidity intensity, overall aroma intensity and overall quality, largely increased up to the second grape ripeness level and only slightly increased after that. 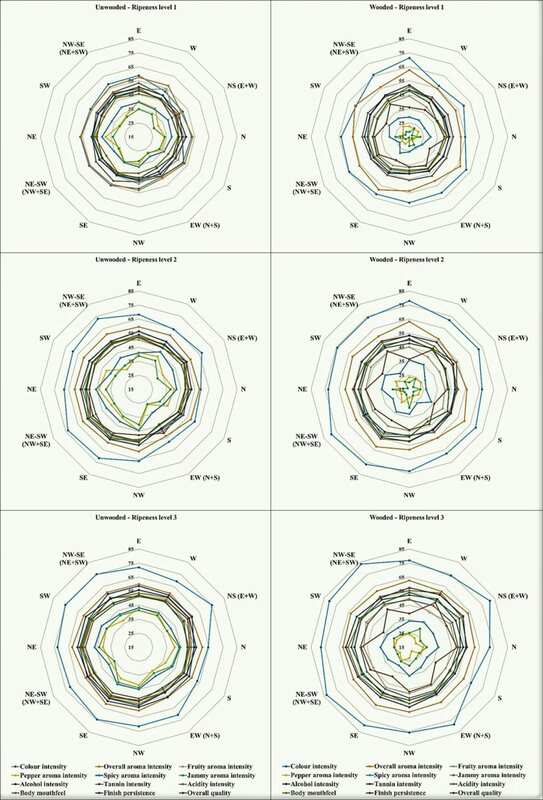 Addition of oak further segregated visual (e g colour intensity), aroma (e g overall aroma intensity) and taste (e g alcohol intensity, body mouthfeel and tannin intensity) profiles. It added prominence to colour intensity, mostly reduced the perception of fruity-, pepper-, spicy-, jammy-, tannin- and alcohol intensity, whereas it seemed to have little effect on acidity, body, finish persistence, overall aroma and overall quality. At the first grape ripeness level (23°B), wines of NS (E + W – normal harvesting), separate sides (E, W) of the NS-orientated rows, those of normal harvesting (NW + SE) of the NE-SW-orientated rows and those of all wines made from the NW-SE row orientations (separate sides, NE and SW, and normal harvesting, NE + SW) showed best association with descriptors. At the second grape ripeness level (25°B), wines best associated with the wine style descriptors were obtained from separate sides (E, W) of NS-orientated rows and from all wines made from NE-SW and NW-SE row orientations. At the third grape ripeness level (27°B), a similar pattern (except for the low descriptor association of wines made from grapes on the E side of NS-orientated rows) than that found at the second grape ripeness level occurred. Overall aroma intensity, pepper aroma intensity, fruity aroma intensity and jammy aroma intensity in wines made from low ripeness level grapes, and addition of spicy aroma intensity in these wines with further ripening. Colour intensity, spicy aroma intensity and overall aroma intensity in wines made from low ripeness level grapes, and addition of fruity aroma intensity and overall quality in these wines with further ripening. It appears that colour intensity, overall aroma intensity, fruity aroma intensity, pepper aroma intensity, spicy aroma intensity, jammy aroma intensity, body mouthfeel and finish persistence may be considered more important to distinguish treatment differences amongst unwooded wines. Alcohol intensity seemed a weak indicator at all ripeness levels, acidity intensity an indicator only at the first ripeness level, and tannin intensity an indicator only up to the second ripeness level in these wines. In wooded wines, acidity intensity had a weak distinguishing role in treatment differences at all ripeness levels, alcohol intensity had a distinguishing role only at the first ripeness level, and overall aroma intensity, along with overall quality, had a distinguishing role only at the first two ripeness levels. Spiciness seemed to have a distinguishing role only at the middle ripeness level (masking that of pepper intensity). Colour intensity, fruity aroma intensity, jammy aroma intensity, body mouthfeel, finish persistence and tannin intensity emerged as consistent distinguishing descriptors in wooded wines at all ripeness levels. The latter showed least prominence in wines made from grapes harvested from E, S, SE and SW canopy sides. FIGURE 1. Row orientation and ripeness level effects on unwooded and wooded wine sensory characteristics of Shiraz/101-14 Mgt [five-year average at ripeness levels 1 (approx 23°B), 2 (approx 25°B) and 3 (approx 27°B)]. Separate canopy sides refer to wines made from grapes harvested on each side of the canopy and canopy sides indicated by a ‘+’ refer to wines made from grapes obtained by normal harvesting (all grapes). The tannin intensity wine descriptor surfaced as a good indicator of row orientation/canopy side/ripeness level treatment differences in wooded wines in particular, whereas total anthocyanin and phenolic extraction were increased with higher ripeness level and as such perceived in the corresponding sensory profiles. Although a common profile trend was principally maintained from unwooded to wooded wines, it is clear that the addition of wood-enhanced multi-layering/dimensionality in wines of which the profiles showed more depth and reach than the unwooded wines of which some descriptors seemed more difficult to define/separate. However, both unwooded and wooded wines seemed to increase in richness and complexity as the grapes ripened further (especially up to the second ripeness level) and specific descriptors developed prominence and/or others were masked by mutual interaction and dependence. The behaviour of compounds within mixtures/matrixes of odorants remains complex and difficult to define. Macro-, meso- and micro-environmental conditions, as well as viticulture practices, would all affect these compounds directly or indirectly via chemical and/or physical changes. The canopy therefore has a critical and increasingly important role as berry development and ripening proceed during the season, to support balanced grape composition, to further formation of primary and secondary compounds contributing to taste and structure of wine, and to prevent flavour and colour loss by over-exposure and over-ripeness. Grapes should only be allowed to ripen to higher ripeness levels under uniform growth conditions, judicious management and favourable climatic conditions in order to maintain control over must chemical development and balances, as well as to prevent tempering of expected outcomes and economic viability/sustainability. Berry sunlight exposure and temperature are well-known regulating drivers of biochemical and physiological processes during berry development and ripening that determine oenological quality, but judicious exposure of foliage and grapes is required. Considering yield differences between row orientations (in a companion article), it can be argued that yield was a weak driver (if at all) of wine style/quality and that sensory profiles were rather driven by a combination of environmental and vine physiological factors, as well as berry physical/chemical/biochemical factors. Results obtained for each row orientation may therefore change under different terroir (climatic, soil and topographic) conditions, because of likely effects on, e g light penetration into the canopy [inter alia depending on trellis type, vine vigour, canopy density, canopy management actions (suckering, positioning and orientation of shoots, leaf thinning and tipping/topping)], photosynthetic activity and water relations. These factors impact on metabolism of the vine, yields, grape exposure (full or partial), berry temperature, biochemical ripening processes, final berry chemical composition, uniformity of berry ripening and physical berry condition and health, leading to specific wine styles. The light interception and bunch temperature profiles induced by orientating rows in different directions may therefore have cumulative, differential and combined effects on berry composition and eventual wine style. This would impact on row orientation decisions and vineyard management focus for different terroirs. Erratic weather conditions and a long-term change in climate are serious impacting factors on expected outcomes in yield, grape composition and wine style within a specific terroir. Holistic, judicious and dynamic management strategies (including long-term and short-term/seasonal practices, interpretation of vine physiological response behaviour and the impact of terroir factors) would have to be developed in order to buffer grapevines, wine styles and markets against potentially detrimental effects caused by weather/climate conditions. Challenges lie in viable adaptation over the whole spectrum of plant material, vineyard practices, oenological techniques, marketing and price points. Spatial changes in (and within) grape growing regions and cultivar (existing and new) allocation to matching terroirs seem unavoidable to combat long-term potential effects of climate change. 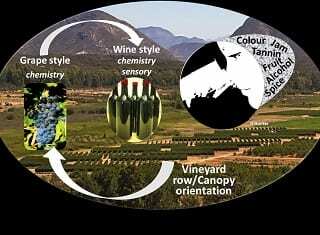 Wine style represents an all-inclusive array of factors, including terroir, cultivation techniques and the winemaking process. A combination of row orientation (whole canopy and separate canopy sides) with different harvesting dates, offers distinctive characteristics in grapes and wine for a specific terroir and a further dimension in exploration of vineyard yield potential – this is globally relevant and extrapolative to other cultivars, irrespective of likely quantitative and qualitative changes. Options for wine styles per vineyard are increased by different row orientations. Grapes should only be allowed to ripen (to higher ripeness levels) under uniform growth conditions and judicious management, to maintain control over must chemical development and balances. Row orientation as viticulture practice has a significant role as one of the management tools to combat the impact of climate change, especially with regard to its effect on light radiation profiles and offering of different wine styles. The NW-SE and NE-SW row orientations generally resulted in highest wine scores, followed by NS. Wood addition enhanced specific sensory descriptor perceptions. High quality unwooded and wooded wines were obtained from grapes on separate sides of NW-SE and NE-SW, followed by NS sides, i e E and W. Poorest wines were obtained from EW rows, but grapes from the N side of the canopy always resulted in better wine from this orientation. The NW-SE and NE-SW row orientations generally resulted in highest wine scores, followed by NS. Wood addition enhanced specific sensory descriptor perceptions. High quality unwooded and wooded wines were obtained from grapes of separate sides of NW-SE and NE-SW, followed by NS sides, i e E and W. Poorest wines were obtained from EW rows; grapes from the N side of the canopy always resulted in better wine. Row orientation and different canopy sides, combined with harvesting date, offers a further dimension in exploration of vineyard potential for wine styles and marketing. Row orientation compliments other viticulture practices. It is an important tool to combat the impact of climate change, especially with regard to its effect on light radiation profiles and offering of different wine styles. The ideal row orientation would depend on grape and wine style objectives/targets and thorough consideration of relevant terroir conditions, including cultivation practices. Zorer, R., Volschenk, C.G. & Hunter, J.J., 2017. Integrating geographic information systems and hemispherical photography in the assessment of canopy light profiles in a vineyard. Agricultural and Forest Meteorology 232, 672 – 681. Hunter, J.J., Volschenk, C.G. & Booyse, M., 2017. Vineyard row orientation and grape ripeness level effects on vegetative and reproductive growth characteristics of Vitis vinifera L. cv. Shiraz/101-14 Mgt. European Journal of Agronomy 84, 47 – 57. Hunter, J.J. & Volschenk, C.G., 2017. 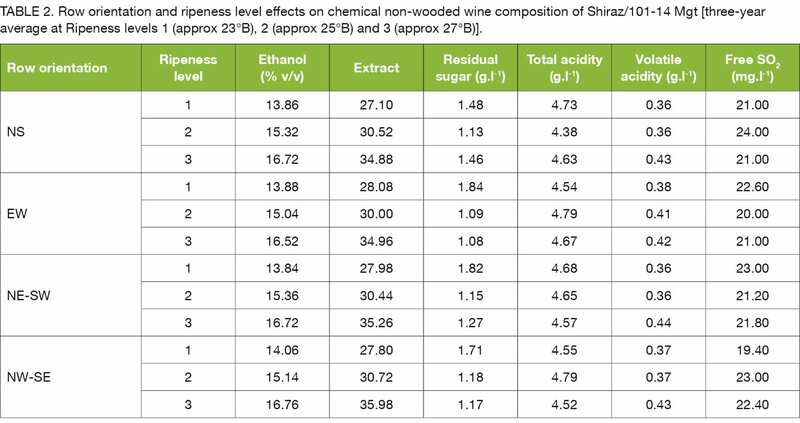 Chemical composition and sensory properties of non-wooded and wood Shiraz (Vitis vinifera L.) wine as affected by vineyard row orientation and grape ripeness level. Journal of the Science of Food and Agriculture. DOI: 10.1002/jsfa.8763.